Rush’s talents are “on loan from God” you know – as if everyone else’s aren’t. * a near quote from one of my favorite (if imperfect) films, Moulin Rouge, whispered by John Leguzamo’s character, Toulouse-Lautrec, the brilliant painter whose childhood accident resulted in short, twisted legs giving him a dwarfish stature. Above is an image of his lovely ‘La Toilette’ (oil on cardboard, painted in 1896) and may be seen in The Louvre Museum, Paris and was obviously created with talents on loan from God, as you see. I have a 30+ year old copy of the book, ‘Masterpieces of the Louvres’ (text by Marcel Brion), which states that the master painter’s ‘olfactory realism’ was taken from Edgar Degas (whose natal chart is discussed on this blog), and that his pointed style of drawing was learned from Japanese prints which were quite popular in France at that time. 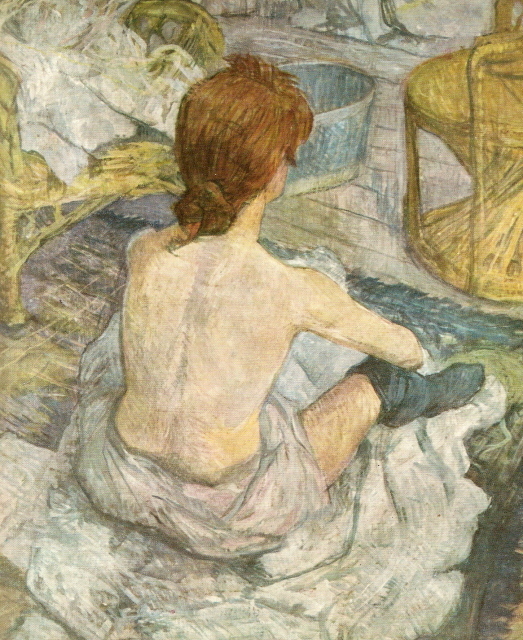 Aristocratic by birth, Toulouse-Lautrec turned his back on upper crust society and frequented the popular dance halls, music halls, brothels, and circuses where his appearance would shock the least. “Libertines and vagabonds” were his companions as he wandered at night through “disreputable streets” – which is more than a little like hanging out on Capitol Hill 2008, isn’t it?